Seven well-known consumer groups acting together as the Safe Food Coalition are petitioning USDA’s Food Safety and inspection Service for a revised safe handling instruction label for meat, poultry and catfish. The petition calls upon FSIS to continue to require that labels include information about the potential risk of pathogenic contamination in USDA-regulated meat and poultry products while further requiring that labels provide more specific information about safe handling and cooking practices for meat, poultry and catfish products. The Safe Food Coalition, active since 1993, includes the Center for Foodborne Illness, Research and Prevention, Center for Science in the Public Interest, Consumer Federation of America, Consumers Union, Food and Water Watch, National Consumers League, STOP Foodborne Illness, and the Government Accountability Project. They describe themselves as representing consumers, public health interests, victims of foodborne illness, and “labor organizations dedicated to reducing the burden of foodborne illnesses in the United States by improving government food inspection programs.” The current Safe Handing Label text as mandated by the Code of Federal Regulations, Title 9, Parts 317 and 381, has remained the same since 1994. Here’s what those labels say: Safe Handling Instructions This product was prepared from inspected and passed meat and/or poultry. Some food products may contain bacteria that could cause illness if the product is mishandled or cooked improperly. For your protection, follow these safe handling instructions. Keep raw meat and poultry separate from other foods. Wash working surfaces (including cutting boards), utensils, and hands after touching raw meat or poultry. The petition asks for revisions that would require Safe Handling Instruction (SHI) labels to include recommended internal end-point temperatures ― and rest-time requirements that allow for bacteria to die off after cooking ― as well as instructions to use a thermometer to verify internal temperatures, among other information. The petition also requests that USDA require SHI labels for all raw or partially cooked siluriformes fish, including catfish products, which now fall under USDA‘s oversight. USDA catfish inspection began only on March 1, after years of confusion over whether or not 2008 and 2014 farm bill provisions were going to be implemented by FSIS and FDA. The Senate just voted on May 25 to switch catfish inspection back to FDA from USDA. The resolution is now before the House. “Many consumers read the current labels and think they know what ‘cook thoroughly‘ means, but the research shows there is a lot of confusion out there,” said Patricia Buck, executive director for the Center for Foodborne Illness Research & Prevention. “Using a thermometer to verify the internal temperature of meat, poultry and catfish products is one of the most important ways to avoid a foodborne illness, and the labels should reflect that fact.” The petitioners say their proposed changes are backed up by research on consumer behavior in the kitchen and grocery store in addition to laboratory studies on the survival rates of pathogens at specific end-point temperatures. Thomas Gremillion, director of Food Policy at Consumer Federation of America, says remaking the Safe Handling Labels will lead to more informed consumer choices that will benefit public health and the food system as a whole. 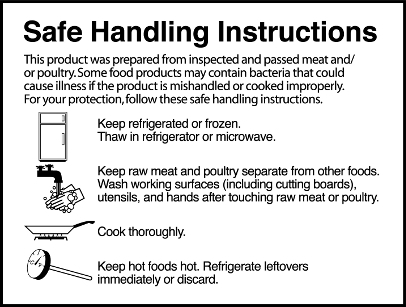 This is the current safe handling label example from USDA’s Food Safety Inspection Service. A web address on the package for additional information on meat, poultry and catfish cooking recommendations.